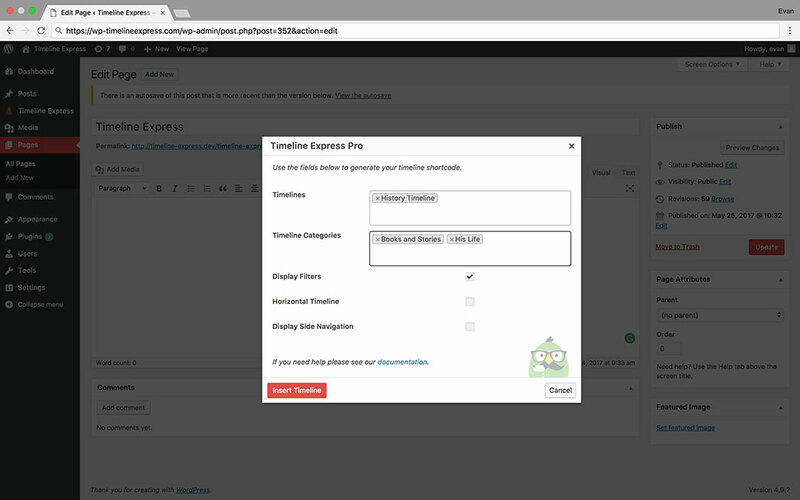 *A license allows to install and use Timeline Express on a site for an unlimited period of time. **To continue to receive support and updates, all licenses will auto-renew after one year. License renewals are given a 40% discount! 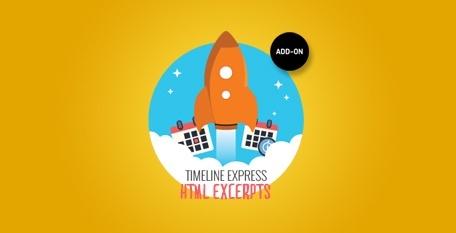 Timeline Express PRO comes loaded with features. You control what data is displayed on your timeline, how your timeline looks and how it animates. Timeline Express Free & Pro both come bundled with Font Awesome. Meaning, you have hundreds of icons to choose from to assign to your announcements. Use the shortcode generator to create intricate timelines without having to worry about whether or not your shortcodes are the proper format. When you buy a copy of any of our products, you’re actually buying an entire year’s worth of development, new features, bug fixes, and support. We perform regular maintenance releases to correct bugs or introduce new features. This release pattern allows us to listen to our users. We’re always looking for feedback from our community, and letting that guide our decision making process. We value design greatly. Design doesn’t just mean pretty. It means tools that are easy to use, intuitive, and delightful. We always evaulating our user' experience and product UI to always be improving and iterating. Beyond designing for user experience, we also want ensure all of our products look amazing on everyone’s website. 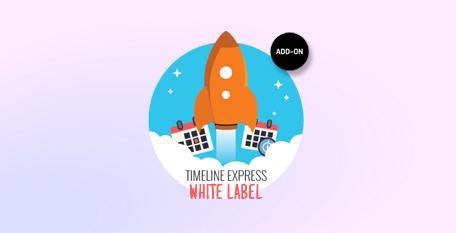 We continue to do our best to make sure using Timeline Express Pro is a seamless experience for you and your users. 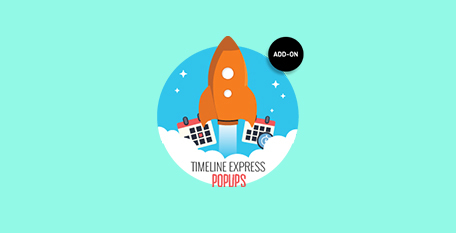 Timeline Express Pro expands ontop of the popular Timeline Express. With a wide array of customization options, hooks & filters you can fully customize your timeline how you see fit. 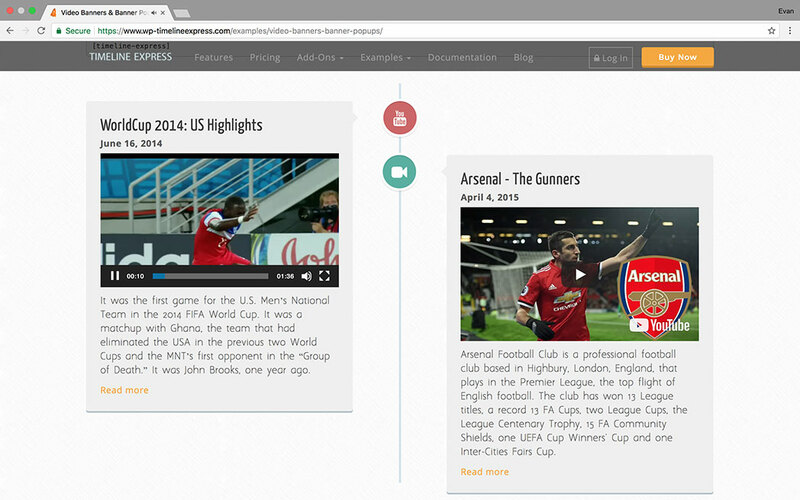 We've added a ton of great features and functionality so your timeline fits your needs. Add what you need, remove what you don't. For a full feature list, take a look at our complete feature list table. Fully responsive, so the timeline looks great on all devices - from large computer monitors down to small mobile devices. Timeline Express closely follows the WordPress coding standards, to ensure a top quality, high performing and secure plugin. Quickly generate complex and dynamic timelines using the built in shortcode generator. Powerful settings allow for a greater breadth of customizations - and for more dynamic and personal timelines. 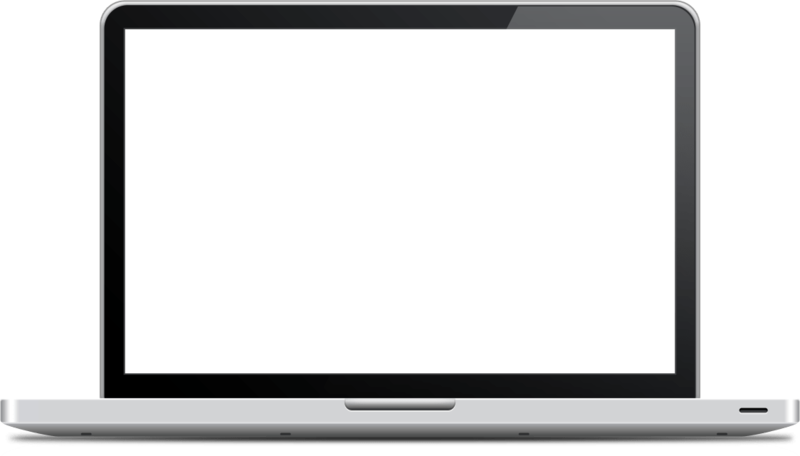 Timeline Express is battle tested in the latest browsers, including Internet Explorer (v9+), to ensure a seamless cross browser experience. 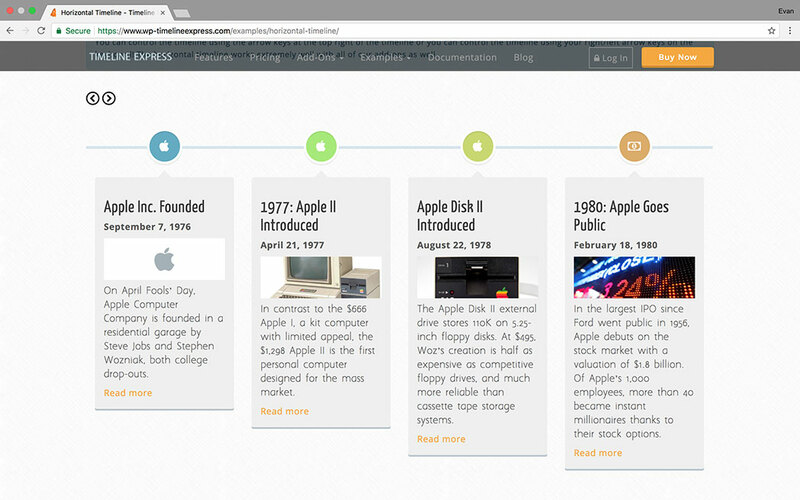 Timeline Express is used by users all around the world, from smaller websites to large scale universities and corporations. We've set out to document every aspect of Timeline Express. 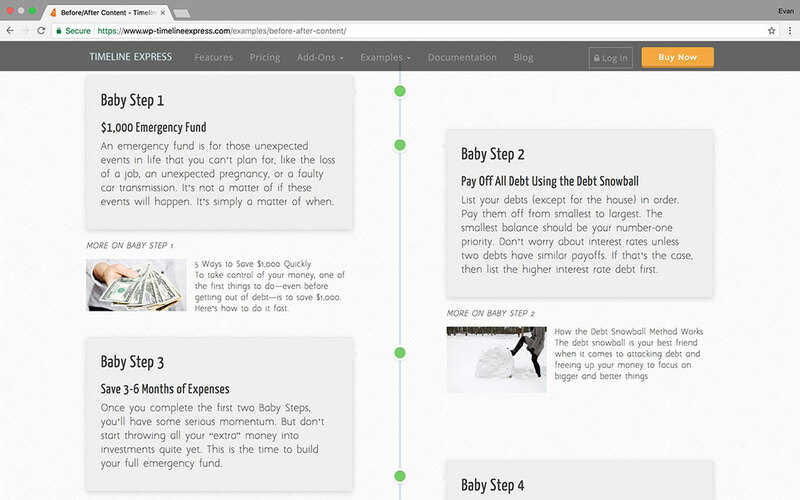 That includes the actual code base, with inline documentation - and here on the site. We have thousands of users all around the world using Timeline Express. 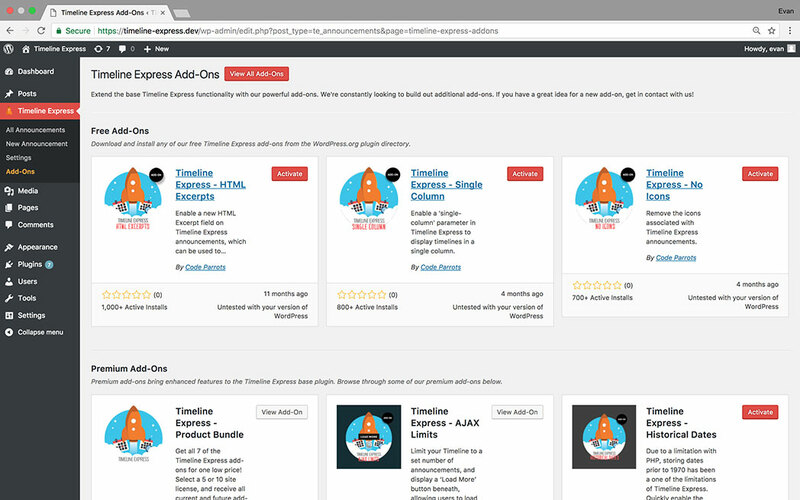 We're constantly building new add-ons and features for Timeline Express to increase its use cases. Beautiful in Every Browser, on Every Device. 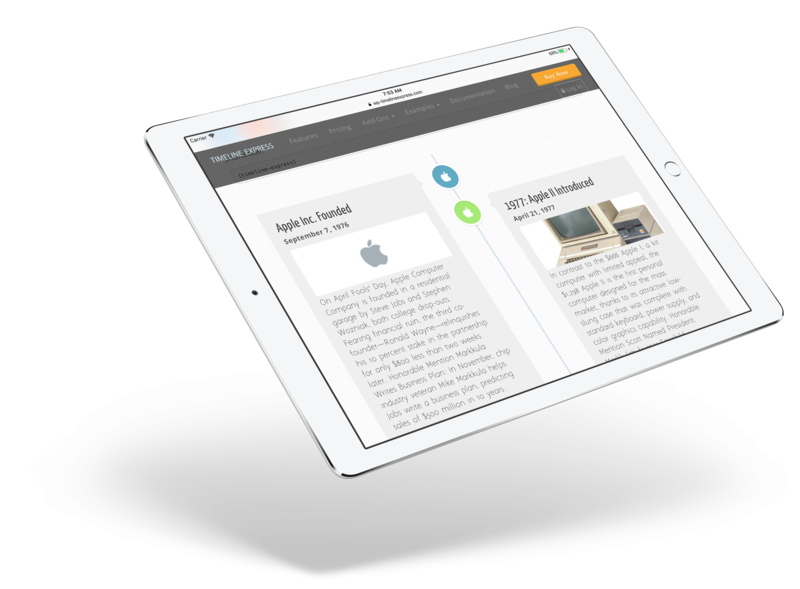 Timeline Express was designed to look great and function properly on all devices. In our ever growing mobile world, it is crucial that your Timeline works well and performs on older devices and browsers. We have add-ons for all sorts of use cases. Take a look at the complete list of our add-ons. Our support team is here to help with any questions you might have. Not sure if Timeline Express can do what you need? Need advice with your project? 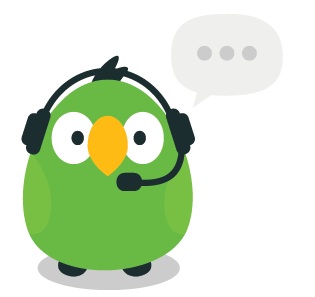 Whatever it is, our award winning team of support parrots are here to provide guidance and solutions. This is a solid WordPress plugin, and their support team is fantastic. 5 stars! Thanks guys. 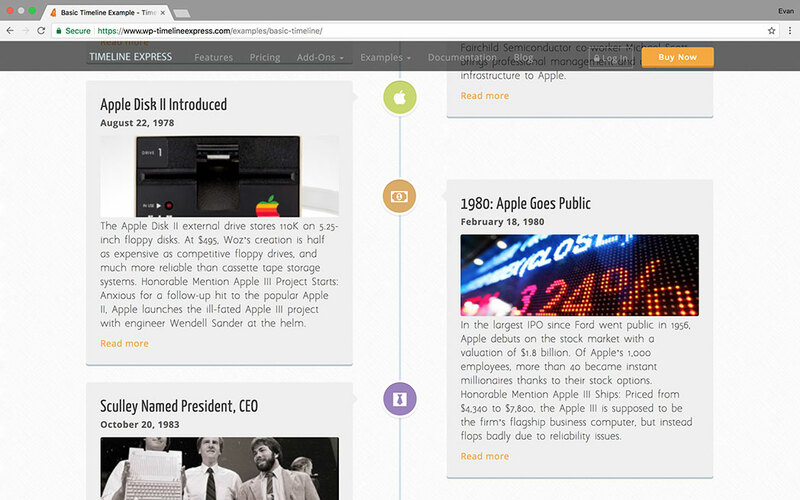 I had to make a timeline to show various business milestones for my company and this plugin was exactly what I needed! Excellent and very quick support for plugin that is already the best of its kind – and very flexible. Timeline Express is Trusted by Hundreds of Thousands of Businesses Around the World.